Mike Smith is one of five Coyotes picked to compete in next month's Winter Olympics in Sochi, Russia. 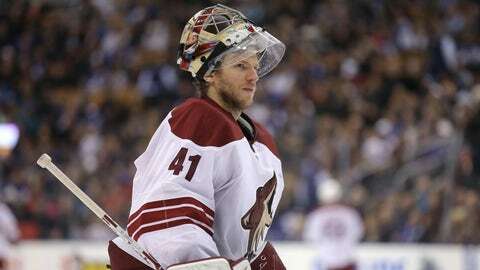 GLENDALE, Ariz. — Mike Smith admitted that Team Canada’s Olympic hockey selections were weighing on his mind. 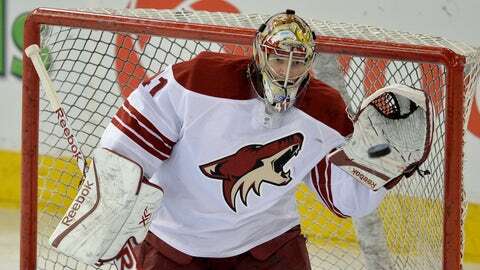 "It’s just going to be nice to have it done with," the Coyotes goalie said Monday. "It’s an exciting time and it only comes around once every four years, so your opportunity to represent your country gets smaller and smaller as you get older and older. "This is a perfect time in my career to have the opportunity to do that." Smith will get that opportunity. He was among the three goalies chosen Tuesday to represent his nation — the others were Vancouver’s Roberto Luongo and Montreal’s Carey Price — at next month’s Winter Olympics in Sochi, Russia. "Whether it’s practice or watch from the stands or whatever it is, it’s just an exciting process and an unbelievable team to be a part of," he said. Smith’s mother-in-law, Diane Pratte, is in town. Both she and her daughter, Brigitte (Smith’s wife), competed in prior winter Olympics as alpine skiers — Brigitte in 2006 and 2010 and her mom in 1972 in Sapporo, Japan. "Her grandparents were there, so they were saying this morning in their cute little French voices that there’s three Olympians in the house, which is pretty surreal to me," Smith said. "I never thought I’d be in this position. I look back four years ago and I’m in the minors not knowing if I’d ever play in the NHL again, and here I am today, getting announced to the Canadian Olympic team. I’m speechless." Phoenix coach Dave Tippett knew the selections were weighing on his goaltender, so he gave him the night off when the Coyotes host the Calgary Flames on Tuesday at Jobing.com Arena. Thomas Greiss will start in his place. The Coyotes had two other players selected to Olympic rosters on Tuesday. Defenseman Oliver Ekman-Larsson, who Tippett said could return from a head injury as soon as Thursday, was named to Sweden’s roster, and wing Lauri Korpikoski made Finland’s roster. The Coyotes’ three Olympic selections on Tuesday join the Czech Republic’s Martin Hanzal and Zbynek Michalek, who were named Monday, giving Phoenix five Olympians. Michalek is still recovering from a hip injury but has resumed skating and practiced with the team on Tuesday morning. Czech Radim Vrbata and American Keith Yandle were notable snubs from the Coyotes’ roster, but Vrbata had mixed feelings about the omission. He was concerned how the travel would impact him for the stretch run of the NHL season, and his wife, Petra, is pregnant. "I don’t think she could travel too far, and I don’t think she wants to travel too far," Vrbata said. "It will be a nice break." An NHL source confirmed that Coyotes assistant GM Brad Teliving interviewed for the open GM spot in Buffalo a couple weeks ago. Treliving has been the Coyotes assistant GM for seven seasons. Prior to that, he served as the president of the Central Hockey League for seven years and co-founded the Western Professional Hockey League in 1996.